I’m a big fan of getting creative with leftovers, and reducing food waste. So this past weekend, I had a real craving for some really good roast beef, and I decided to make my own, as I typically do. This made a lot of roast beef, which I was excited for, however roast beef is something that my wife and kids typically do not lean towards when they are making sandwiches during the week. Me? Yes, but with that said, I knew I would grow tired of the standard sandwich, and be left to vacuum seal the rest of it. Before I froze the rest, I saved a bit of it, and decided to rummage around my fridge and pantry looking for things to make with it. 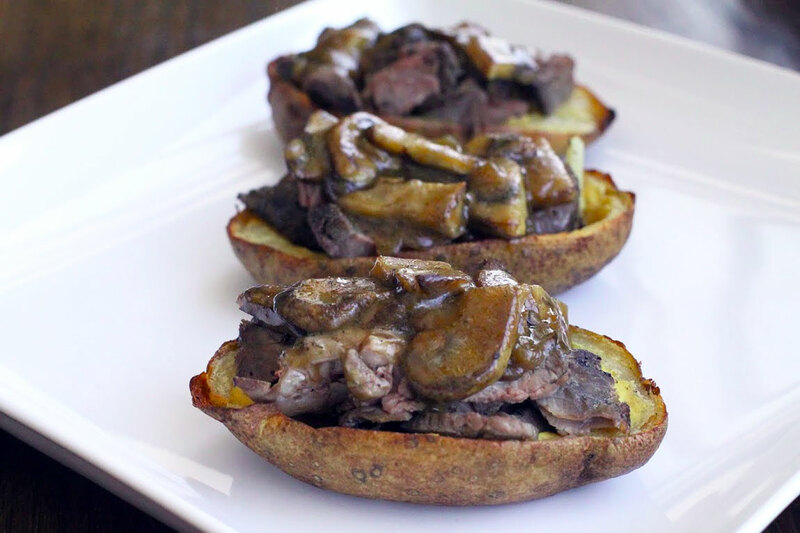 So while looking around, I had a few potato skins that I had vacuum sealed, so I brought those out, as well as some leftover caramelized mushrooms that we had the night before, and that is when I decided I would make this all in one, awesome meal, and hence the roast beef potato skin was born. Remove them from the oven and prepare everything for the next step. Make the gravy by adding the cooked mushrooms to a skillet. Bring them up to a medium, to medium-high heat. Add the corn starch to the beef stock, and whisk with a fork until the corn starch is incorporated. Add in the Worcestershire sauce as well and give that a good stir. Add the mustard and horseradish to a small mixing bowl, and give a good stir. Add the beef stock mixture into the skillet and cook until it get nice and thick like a gravy should. This should only take a few minutes. Once thicken, turn off the heat and set the skillet to the side. Preheat the oven to 400 degrees. The oven should already be nice and warm from the broiler. 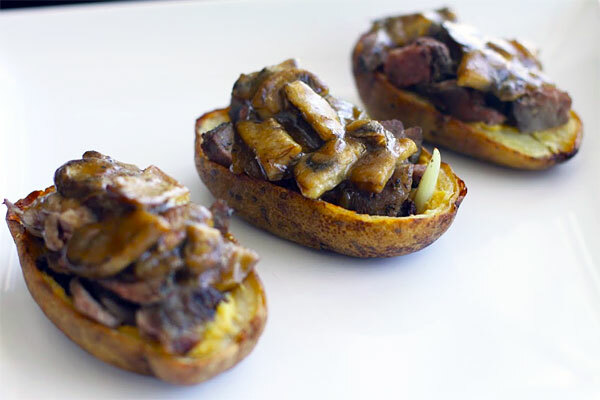 To assemble the roast beef potato skins, lather the bottom of each potato skin with the mustard and horseradish mixture. Top that with the roast beef, and spoon on the mushroom gravy. Place these onto a baking sheet and into the oven for 5 minutes, just to warm the roast beef and gravy together. The end result is a perfect bite. The roast beef when paired with the horseradish is amazing, and then you get that savoriness from the mushroom gravy. It really is a perfect few bites, even so much whereas my wife even participated and fell in love with them. So if you are looking for something to create with any of those leftovers, give these a shot! Hope you enjoy. Add the corn starch to the beef stock, and whisk with a fork until the corn starch is incorporated. Add in the worchestershire sauce as well and give that a good stir.